DutzWorks - Illustration and Graphic Design by Derrick Utz: Bots Amusement Park - Logo Progress!! 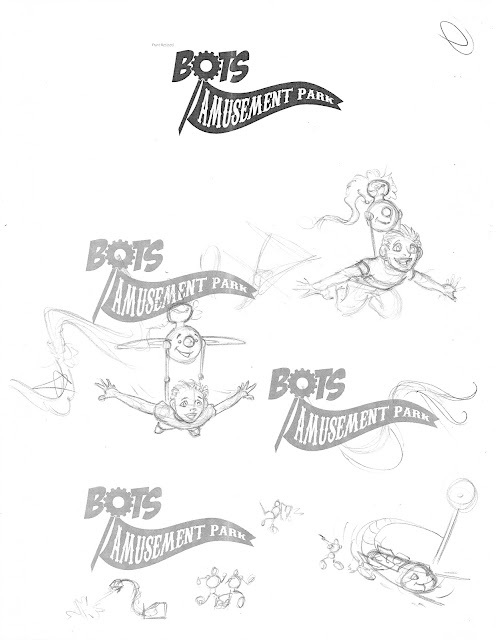 Bots Amusement Park - Logo Progress!! What a ride on these artistic waters since the last time I posted here!!! Well, to break down some of the crazy, I just want to tell you all a few things about the progress of the "Bots Amusement Park" logo and story. This is my current major personal project and will consist of one story made by me that am planning on being around 50 pages. It will be a landscape book, wider than it is tall, and will be a family oriented sic-fi/fantasy book. It will be a little different than a graphic novel or comic like I would normally shoot for but there is a reason for that. I realized that I cannot stop time to work on my projects. Yeah, what a concept! I cannot control time! So...I realized, thanks to great mentors like Lora Innes and Chris Oatley and dear loved ones like my awesome wife and best friends, that I have to be very thoughtful and selective about what projects I do work on and how I execute them. With this realization, I knew that I had to put Kodi the Starfish on break for a time and refocus on a more efficient story that I could complete sooner. This is what brought Bots out of my idea box (a.k.a. -my "Lightning Box" because I use it to catch the lightning). With this story I still get to tell a heart-felt tale, which matters greatly to me, and I can be more efficient due to the way I will be producing the book. You will understand more as I start production, I don't want to ruin the surprise, he he. Thats what brings us to these posts where I will show you different parts of the story and book as I complete them and am able to post them. What you see as the header up there is the base version of the Bots logo. I hope it speaks volumes to the robot fun that will be in the book! So, with this as the base level of the logo, my wife gave me great ideas on how I need to dress up the logo so that is the next step. Also, just to give credit where is is so very due, the reason the logo has turned out this awesome is because If how many great ideas she gives me! Thanks babe!! So, below are some sketches where I am working on broadening the ideas out and I have narrowed down some of the art on the following picture. Then, once I have the main illustrative element (the kiddo being flown around by the robot) I am looking to do some fun, theme park-like art and other robots playing around the rest of the logo. Its going to looks so neat!!!! As a graphic deisgner I know that one of the most important elements of a project and brand/story is the logo so as I have been working on the story and characters under the radar, I wanted the logo to be one of the main elements I get finished first. Then, i can anchor (pirate talk) future art and information to it and you, the audience and fans will be able to recognize what I am posting because the logo connects all of the pieces. Ok, enough geek talk! Onward to the doodles!! Please let me know if you have any questions or comments and I will post more images as I get this fun part of Bots Amusement Park's story finished! This is the full sketched sheet. This is a composite piece combining the logo with a main character sketch. I plan to have these two elements be the focus of the logo (and possibly the book's cover) and will add other fun little elements around them. Enjoy!